I’ve had a recipe for jalapeño cheese bread in my recipe folder for a couple of weeks now and just hadn’t gotten around to trying it. Then, I went to the grocery store earlier this week and found that hatch chiles were in season. Hatch chiles are peppers grown in Hatch, New Mexico and are a good balance of flavor and spiciness – not too hot, not too mild. There was hatch chile cornbread, hatch chile tortillas, hatch chile guacamole, and even hatch chile marinated salmon. That was enough motivation to get me to try out the jalapeño cheese bread recipe but substituting hatch chiles for the jalapeños. In the Southwest, people get pretty excited when hatch chiles come into season in late summer. I don’t get excited about hatch chiles the same way I get excited about peaches but I’ve been known to throw a few hatch chile items in my grocery cart when they become available. So why not some hatch chile cheese bread? I don’t consider myself a really experienced bread baker. I can’t intuitively tell when the water is the right temperature to proof the yeast or know when a loaf of bread is baked all the way through. So, I rely on an instant read thermometer to help me. Before I started using one, I would constantly get the water too hot (which kills the yeast) and wonder why my baked goods didn’t rise properly. Using a thermometer takes the guesswork and anxiety out of working with yeast doughs. I also rely on my Kitchen Aid stand mixer and the dough hook. I’m not one of those people who finds kneading dough relaxing or a good way to take out aggression (unlike my husband who actually enjoys kneading bread dough by hand). I would much rather throw everything in the Kitchen Aid and let it do the kneading for me. However, owning a stand mixer isn’t a requirement to make this bread. It’s perfectly fine to knead everything by hand. 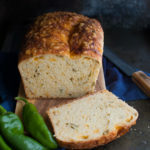 This hatch chile-cheese bread is great with some BBQ or a bowl of chili but if you really want to make someone happy, make them a grilled cheese sandwich with this bread. Because as my kids like to say – you can never have too much cheese. You’re welcome. Melt 1 tablespoon butter in a small skillet over low heat. Add peppers and sauté until softened, 5 minutes. Cool to room temperature. In a small bowl, stir yeast into water and set aside until foamy, about 5 minutes. Add milk, the 3 tablespoons of melted butter and egg. Mix well. In the bowl of a stand mixer, whisk together peppers, bread flour, 1 cup semolina flour, sugar and salt. Add milk mixture to dry ingredients. Stir mixture with a wooden spoon until dough starts to come together. Attach bowl and dough hook to mixer. Turn to low and mix about 1 minute. Add cheese, increase speed to medium and continue mixing for 2-3 minutes more, or until dough comes together and cheese is evenly mixed in. Form dough into a ball. Generously grease a large bowl with butter. Add dough and roll it around to coat with butter. Cover bowl loosely with plastic wrap and set aside in a warm, draft-free place until dough has doubled in volume, about 2 hours. While dough is rising, prepare the baking pan. Butter a 9-by-5-by-3-inch baking pan. Dust pan with remaining semolina flour. When dough has finished rising, turn dough out onto a well-floured surface and, using floured hands, gently form dough into a rough loaf. Put dough in prepared pan and cover loosely with plastic wrap. Let dough rise in a warm, draft-free place until dough completely fills pan and rises above it slightly, 1 to 1 1/4 hours. Sprinkle extra cheese on top of dough, if desired. Preheat oven to 350 degrees. Remove plastic wrap and bake bread in center of oven until it is golden on top and sounds hollow when tapped on the bottom, 50 minutes to 1 hour. The internal temperature of the bread should also be at least 190 degrees. Cover bread with a sheet of aluminum foil if crust starts to get too brown. Cool in the pan on a wire rack for 10 minutes. Run a knife around edge of pan to loosen loaf, then remove from pan and cool completely on a rack. Recipe adapted from the Houston Chronicle. Oooh, your grilled cheese sandwiches sound amazing! Caramelized onions make any sandwich special. I think you’ll love making sandwiches with this bread. Thank you so much for this recipe. I found it on Pinterest when looking for something to use up a giant bowl of jalapenos we picked yesterday (IN NOVEMBER?). This was quite a bit outside my normal comfort zone – I don’t do much bread-making. I had to use regular flour since that’s all I had, but I followed everything the same and crossed my fingers it would come together. It was delicious. My husband was impressed and my son enjoyed helping me follow all the steps. It was delicious with a bean and pepper soup – perfect for a fall night. Can’t wait to try it again! Your comment made my day!! I love hearing stories like yours – reminds me why I started blogging in the first place. Thank you so much!